After breakfast, proceed on a scenic overland journey to Mount Popa. Visit The Popa Taungkalat Shrine. From the top of Taung Kalat, one can enjoy a panoramic view of the ancient city of Bagan. Morning, transfer to Mandalay airport for flight to Heho. Upon arrival in Heho, transfer straight to Pindaya. Enjoy lunch and visit Shwe Oo Min Natural Cave Pagoda. Late afternoon, drive to Nyaung Shwe jetty and take a boat trip to hotel. Arrive at Yangon International Airport. We welcome and transfer you to hotel. 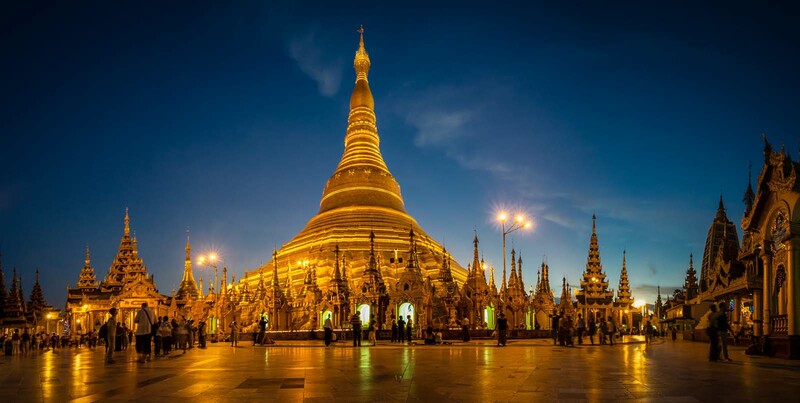 After a refreshment, the tour sightseeing includes visit the old colonial-style city center with the gilded SULE PAGODA, strand road and Yangon Jetty by Car. And visit Bogyoke Aung San (Scott) Market, is the most popular market (close on every Monday & Public holiday) and where you can buy luxury item, handicrafts, food stuff, clothing, jewelry, fashion and consumer goods. Afternoon, continue to Chaukhtatgyi (Reclining Buddha) Pagoda a colossal reclining Buddha, Karaweik Hall Royal barge on the Royal lake for photo stop and world famous Shwedagon Pagoda. Witness the golden dome light up sunshine at the sunset. Early morning, transfer to the airport for flight to Bagan. Arrive in Bagan, transfer to the hotel for check-in. Today, you will have a sightseeing at one of Asia’s most popular archeological destinations. We start the tour by visiting colorful Naung Oo Market. Continue the visit at some famous pagodas including Shwezigon Pagoda, Kyansittha Umin (Cave Temple) and Gupaukgyi Temple. Shwezigon Pagoda or Shwezigon Paya is a Buddhist temple located in Nyaung-U, a town near Bagan, in Myanmar. A prototype of Burmese stupas, it consists of a circular gold leaf-gilded stupa surrounded by smaller temples and shrines. Construction of the Shwezigon Pagoda began during the reign of King Anawrahta (r. 1044–77), who was the founder of the Pagan Dynasty, in 1059–1060 and was completed in 1102 AD, during the reign of his son King Kyansittha. Over the centuries the pagoda had been damaged by many earthquakes and other natural calamities, and has been refurbished several times. In recent renovations it has been covered by more than 30,000 copper plates. However, the lowest level terraces have remained as they were. Kyanzittha Umin means “the cave of Kyanzittha”. This cave is a lowe, unpretentious brick structure with long dark corridors. Located only a short distance west of Nyaung U village is the Kyanzittha Umin. This place is served as a temple for a place of lodging the monks. Kyanzittha U Min means tunnel. It is constructed partly above ground and partly underground. Facing north, it used to have a Dhamma Sala (preaching hall) at its entrance. On the south, there are traces of the site of another Dhamma Sala. The base built of stone still remains there. The Gubyaukgyi (alt. Kubyauk-gyi) temple, located just south of Bagan, Myanmar, in Myinkaba Village, is a Buddhist temple built in 1113 AD by Prince Yazakumar. The temple is notable for two reasons. First, it contains a large array of well-preserved frescoes on its interior walls, the oldest original paintings to be found in Bagan. All of the frescoes are accompanied by ink captions written in Old Mon, providing one of the earliest examples of the language’s use in Myanmar. Second, the temple is located just to the west of the Myazedi pagoda, at which was found two stone pillars with inscriptions written in four, ancient Southeast Asian languages: Pali, Old Mon, Old Burmese, and Pyu. The inscription on the pillar displayed by the Myazedi pagoda has been called the Burmese Rosetta Stone, given its significance both historically and linguistically, as a key to cracking the Pyu language. Afternoon, we continue our tour at Htilominlo Temple which was built during the reign of King Htilominlo, 1211-1231. The temple is three stories tall, with a height of 46 metres, and built with red brick. After that, we approach to Tharabar Gate way and get into Old Bagan. We then visit 3 famous temples including: Ananda Temple, Thetbyinnyu Temple and Dhammayangyi Temple. Ananda Temple one of Bagan’s best known and most beautiful temples. It was built in 1105 AD during the reign of King Kyanzittha of the Pagan Dynasty and was one of the first great temples to be build in Bagan and is well preserved. The temple is found near the Tharabar gate, the only gate remaining of the original 12 in the old Bagan city walls. It is one of four surviving temples in Bagan. Thetbyinnyu Temple was built in the mid-12th century during the reign of King Alaungsithu. It is adjacent to Ananda Temple. With a height of just over 60 meters, the Thatbyinnyu Pagoda is one of the highest monuments of Bagan. The majestic pagoda, towering above other nearby temples and pagodas is visible from much of the Bagan plains. After the single storey pagodas built during the early period like the Shwezigon pagoda, the Thatbyinnyu is one of the first two storey structures built in Bagan. Dhammayangyi Temple is the largest of all the temples in Bagan. The Dhammayan as it is popularly known was built during the reign of King Narathu. Visible from all parts of Bagan, this massive, walled, 12th-century temple (about 1600ft east of Shwesandaw) is infamous for its mysterious, bricked-up inner passageways and cruel history. It’s said that King Narathu built the temple to atone for his sins: he smothered his father and brother to death and executed one of his wives, an Indian princess, for practising Hindu rituals. The best preserved of Bagan’s temples, it features detailed mortar work in its upper levels. Late afternoon, visit Shwesandaw Pagoda and enjoy a sunset senery on the top of the pagoda. A picture of thousand temple in yellow light is just in front of your eyes. Back to the town. Stay overnight night at hotel in Bagan. After breakfast, take a scenic overland journey to Mount Popa which is 1518 meters (4981 feet) above sea level. It takes you 1.5 hour to reach the mount with a distance of 45km. Mount Popa is an extinct volcano with spectacular views and the birth place of the Myanmar ‘nats’ or spirits. The Popa Taungkalat Shrine is home to 37 Mahagiri Nats, or spirits, Statues depicting the Nats are at the base of the shrine. You will have time to climb 777 steps to the shrine at the top of the peak. 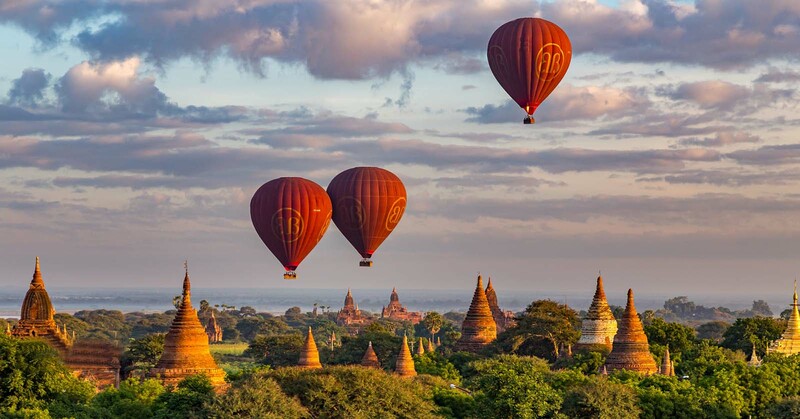 From the top of Taung Kalat, one can enjoy a panoramic view of the ancient city of Bagan. Climb down and return to Bagan. On the way, we stop at a typical local village as well as a toddy palm plantation. Afternoon, spend your leisure time in the city. After breakfast at hotel, we transfer you to Bagan airport for flight to Heho. Upon arrival at Heho, our driver transfers you straight to Pindaya. Pindaya is famous for its limestone caves, its attractive lakeside setting, and the traditional Shan paper umbrellas that are manufactured here. Set deep in the hillsides, the caves (some of which serve as meditation chambers) contain some 8000 Buddhas of various sizes, which are made of white marble, bronze or plaster, and coated with gold leaf. At the entrance to the caves sits the 15 metre tall Shwe Oo Min Pagoda. Enjoy lunch and take a refresh, we start visiting Shwe Oo Min Natural Cave Pagoda which is cramped with over 8,000 of Buddha images. During the course of several centuries thousands of Buddha images have been put inside the cave. Many statues bear the name of the person who donated it. The number of images is constantly growing since people are still adding more, by now there about 9,000. Late afternoon, drive by road to Nyaung Shwe jetty to take a boat trip to hotel (lying on the lake) for check in. Stay overnight at hotel in Inle Lake. Transfer to airport for flight to Yangon and await for your departure flight.